We didn't have anything good to say about Invensense, Vanguard Natural Resources, or Plug Power. While investing, in general, is fraught with risk, some stocks are downright dangerous. Intense competition, concerning credit, and soaring dilution are just some of the issues that can lead to abysmal returns. Our contributors think those returns are what await investors who are considering the following three stocks. Brian Feroldi: The consumer electronic space is a tough place to make a buck, which is a big reason I've never been a fan of Invensense (NYSE:INVN). The company specializes in making motion-sensing chips, which are used in a wide range of consumer electronic devices, including smartphones. The company's end markets have seen explosive growth over the last few years, which in turn caused Invensense's revenue and profits grow significantly. That took the stock price down with it for some time. The space Invensense operates in is extremely competitive, and the company decided to start discounting its products in order to capture additional market share. That strategy tends to juice top-line results in the short term, but it can spell doom for profits over the long term. 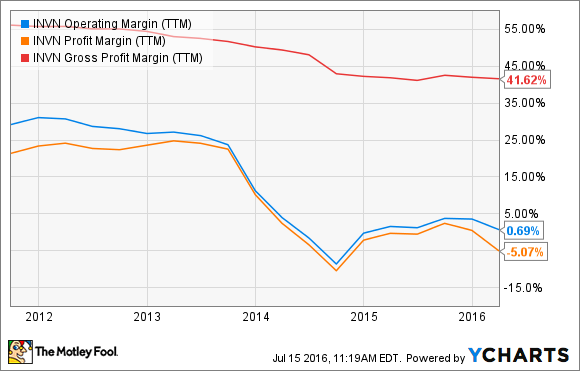 Here's a view of the company's gross, operating, and profit margins over the past few years. See if you can spot a trend. INVN Operating Margin (TTM) data by YCharts. In 2012, the company was wildly profitable. Currently, it's producing a net loss. Why does this happen? Because companies like Invensense tend to sell their products to customers with enormous bargaining power. Those customers put relentless pressure on suppliers like Invensense to lower prices, and since they often promise huge volume in return, companies often cave to their demands. That's why sometimes you can still see revenue growing swiftly, but the bottom line stagnates or even turns negative. To its credit, management is pushing hard to create new products that will benefit from the Internet of Things trend, which could help to offset the pressure they are seeing in their more mature product lines. However, I'm not convinced that, in the long term, the company will be able to maintain its technological edge over hungry rivals like STMicroelectronics and Texas Instruments, so I think any short-term uptick will eventually be eroded away. I personally have no interest in investing in a company that can't maintain its margins over long periods of time, which is why I plan on avoiding this stock like the plague. Matt DiLallo: Upstream MLP Vanguard Natural Resources (NASDAQOTH:VNRSQ) is walking a tightrope. Not only have two years of persistently weak oil and gas prices cut into its cash flow, but the company was over-reliant on its bank credit facility to fund its growth. As a result, the company has a razor-thin margin for error, with the very real risk that it could file for bankruptcy before the end of the year if commodity prices don't vastly improve. Vanguard Natural Resources' biggest issue at the moment is the fact it borrowed $1.424 billion under its credit facility, which became a grave concern after its banks cut its available credit down to $1.325 billion in May. That left the company with a deficiency of $103.5 million that it needs to repay in six equal installments. That said, the company did have about $40 million in cash on hand and projects to generate enough excess cash flow to make all six payments. Still, even if it makes those payments, it's not in the clear. The company's banks could elect to reduce its borrowing base again in the fall if commodity prices remain weak. Further, despite paying down its credit facility over the next six months, its leverage ratio is projected to increase from 4.1 times to 5.0 times by the end of the year. Finally, the company's current cash flow is supported by oil and gas hedges that will be much weaker next year, with its unhedged natural gas volumes rising from 19% in 2016 to 31% next year, while its unhedged oil volumes will surge from 18% to 77%. There is just too much risk that Vanguard Natural Resources' weak financial condition will be its undoing, which is why investors should stay far away. Tyler Crowe: It can be very tempting to invest in companies with groundbreaking technology that have the potential to disrupt the status quo. This is especially true in the energy market, because there is such a staggering amount of money involved. However, the market for alternative energy investments is littered with companies that should best be avoided. 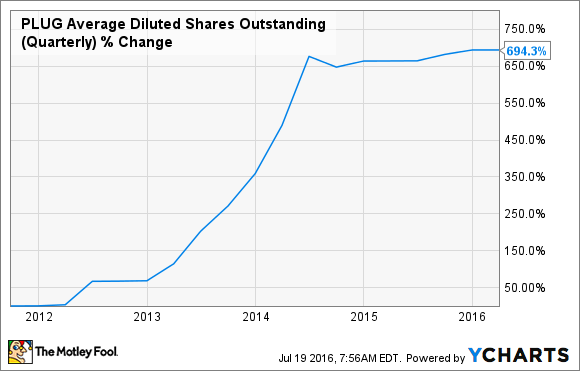 One glaring example is Plug Power (NASDAQ:PLUG). On the surface, Plug Power sounds like a very intriguing investment. The company is developing hydrogen fuel cells that can replace conventional batteries and has carved out an interesting niche in materials handling equipment. Sales have been growing, and it has developed a decent group of customers that could lead to future growth. The problem is that the company is perpetually running into cost issues. For at least three years now, Plug Power's management has said it would be reaching EBITDA breakeven as sales increase and it can spread fixed costs across more production. Every time the company reports earnings, though, its operational losses continue to grow. To make matters worse, the company has been diluting any future returns for investors over the years by issuing new shares to cover its losses at an absolutely staggering pace. There will be opportunities for investors to benefit from the eventual shift in the ways we produce and consume energy, but Plug Power isn't one of those opportunities.